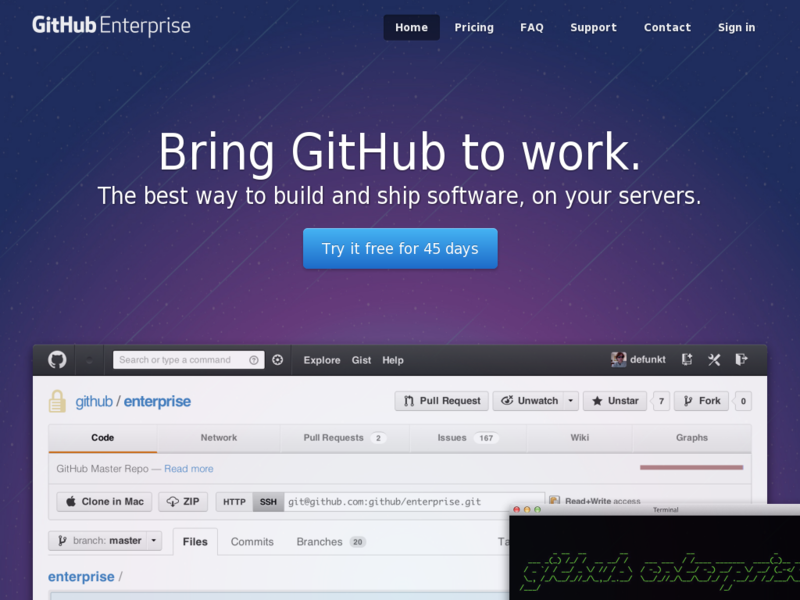 Github Enterprise is basically a local installation of the famous service at github for your company or organisation. Although it comes with a quite a pricetag. In this post I want to show some alternatives that allow you to run a git server on your private network or on any server on the web. I’m not going to go much into detail with the servers that work exclusively on the command line, but focus on the alternatives that have reasonable git web interfaces. 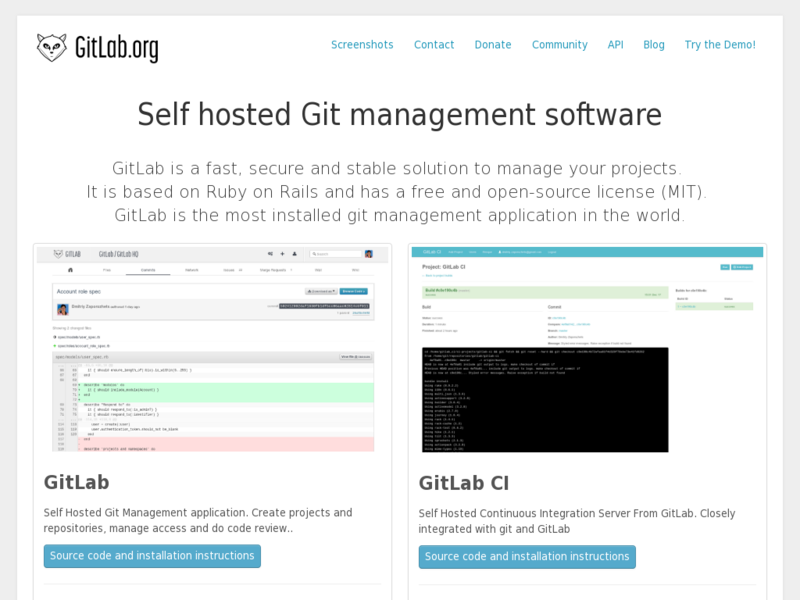 GitLab is written in ruby and comes, besides the web interface, with its own command line tool to handle git connectivity called gitlab-shell. It’s primarily focused on closed source projects, which is why the availability of public repositories is a little limited. It basically gives users access to git, but not the web interface, unless they chose to create a user. Gitea is a fork of Gogs, but seems to have more traction than the original. It’s written in Go and fairly easy to set up. Gitea is not the most feature rich, but it’s a pretty solid alternative. There is no publicly hosted service, but this one is purely for running the server yourself. 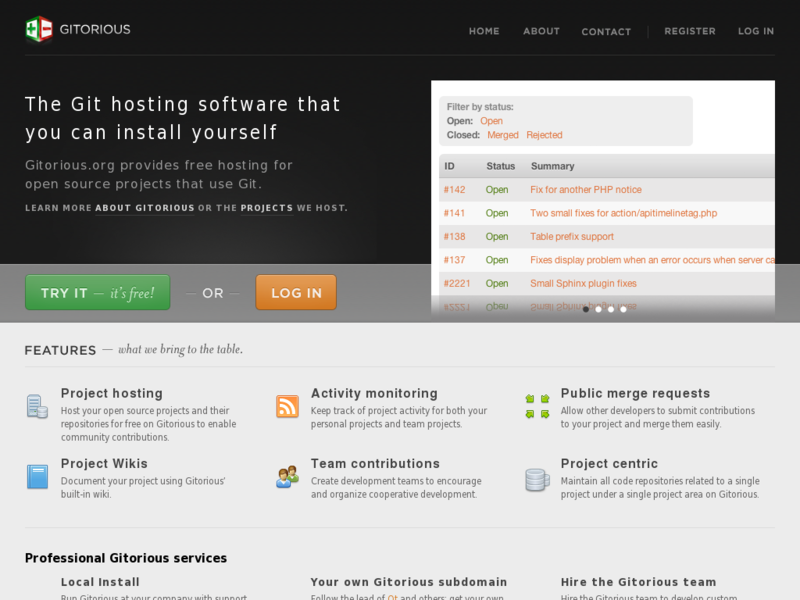 Update: Gitorious has been acquired by Gitlab and is no longer available. Gitorious is another great project written in ruby and operating at a very large scale with their open source hosting at no cost model, similar to githubs. 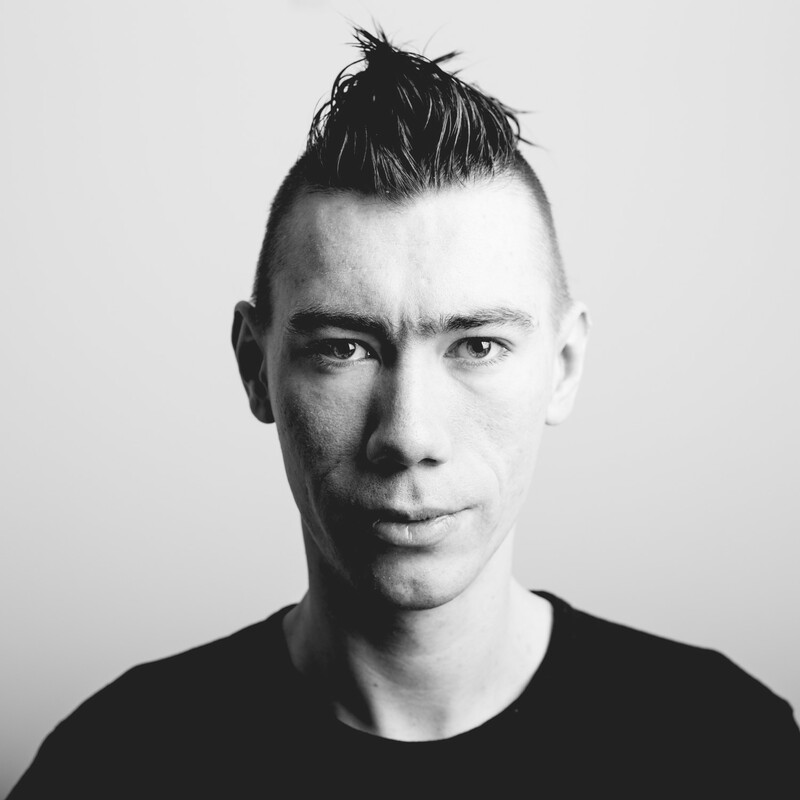 If you want to hear a little more about Gitorious, the GitMinutes Podcast has a really interesting talk with him in Episode #04. 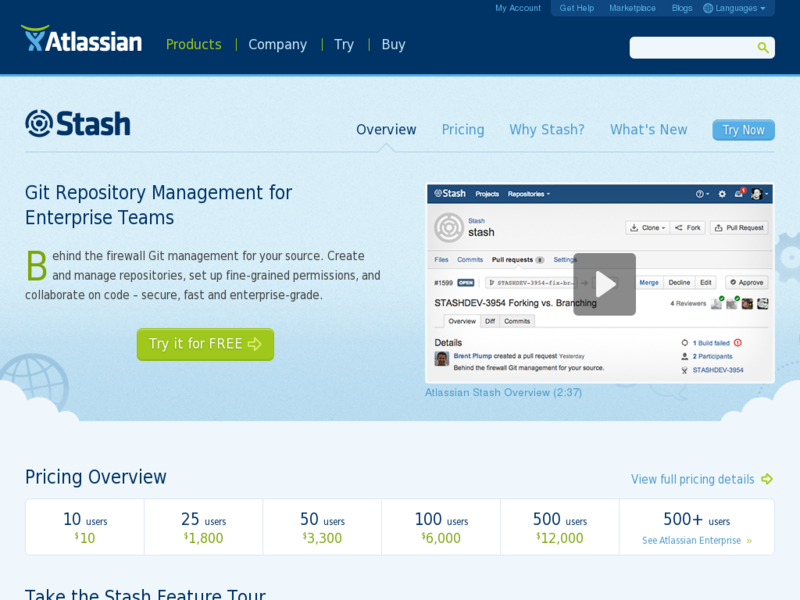 The Atlassian Stash solution requires a license, in contrast to the previously mentioned, it’s not free. You can take a closer look at their pricing, which starts off very reasonable. and a lot more. I haven’t actually looked at more than the material provided on their site, because for a meaningful test, I’d have to integrate it with their other products and services. I included this solution, because Atlassian acquired bitbucket, which has git support in 2010. The wiki at kernel.org has a long list of tools and web frontends for git, which probably covers most projects ever written in the context of git. Pick the tool that fits your needs. After I got started on github and tried it out with a fellow student, I’ve found it quite nice to move to a server with a web interface, also to involve git newcomers. It’s just nice to have something reliable that works independent from where you are in the world and what git clients or operating systems you have access to. Go Git Server (gogs.io) is worth mentioning. Very lightweight and opensource. Thank you for a good coverage on the alternatives. In addition to the tools already mentioned in this blog post, there’s also Deveo. In addition to Git, Deveo is capable of managing Subversion (SVN) and Mercurial (HG) repositories. It’s a compelling option if your organization uses not just Git, but either of the two. Deveo also offers a competitive pricing against GitHub enterprise, Bitbucket server and Gitlab.